What color is the gem of Alexandrite? Beryl is a mineral composed of beryllium aluminium cyclosilicate (page 448 of a chemical textbook) with the chemical formula Be3Al2(SiO3)6. Что соответствует 14 % оксида бериллия, 19 % оксида алюминия, 67 % silicon dioxide. Well-known varieties of beryl include emerald and aquamarine. What structure is formed by the atoms of silicon oxide and Aluminum oxide in Aluminosilicates? In Minecraft it can be obtained from shardPrismarine and Emerald. 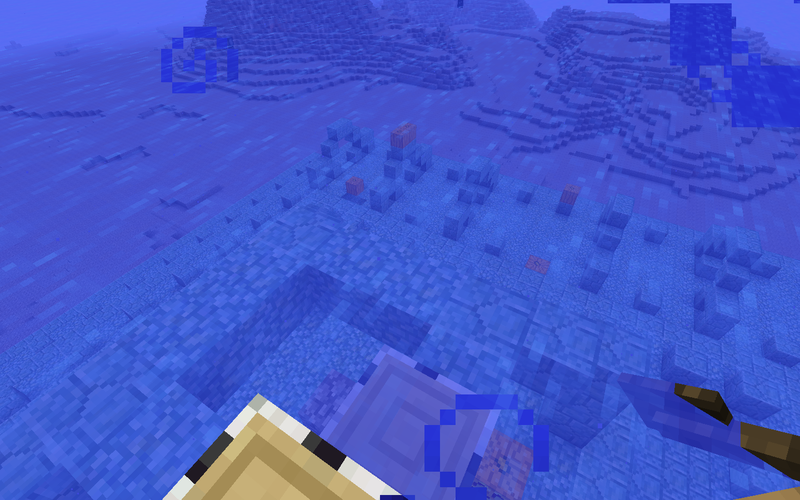 ShardPrismarine can be obtained only in Ocean Monument in the Deep Ocean biome. Because an Ocean Monument is completely underwater, you will need to drink a Potion of Water Breathing if you want to explore the temple. Otherwise, you will run out of air and die. Emerald is a kind of Beryl with an admixture of Chromium and Vanadium, which change the Apple-Green color of Noble Berel to a bright dense green. Accordingly, in Chemical Diazolver from Emerald you can get Beryl, Chromium, Vanadium. Aquamarine is a bluish-green color (the colors of sea water). For the production of aquamarine coloring, irradiation of ordinary beryl with radioactive cobalt is often used. In this way, aquamarines called Maxixe of bright blue unnatural color, which pale with time, are obtained. In this case, as a result of the reduction of trivalent iron, a color change occurs, for example, from a greenish-blue to a blue one. The cultivation of real Artificial Aquamarine is very expensive, so for such stones, fakes are made from other less expensive minerals. Therefore, in our Minecraft Mod, the legendary underwater mineral shardPrismarine in Chemical dissolver is decomposed into beryl and Cobalt_aluminate, which indicates an artificial Aquamarine (which is very expensive to make) or Maxixe (which pales with time). Beryl ore serves as a source for the production of pure beryllium (page 303, 360, 367, 407, 876, 885-886 of a chemical textbook) and alloys based on it. These substances have unique physical and chemical properties. Therefore, they are used in a rare and expensive technique. What is the atomic radius of Beryllium? Beryl bronze makes it possible to produce springs that remain resilient to the temperature of red heat and can withstand billions of load cycles. Beryllium oxide in a mixture with uranium is a very effective nuclear fuel. In laser technology for the manufacture of solid-state emitters. For the production of thermal screens and guidance systems. Beryllium hydride is a rocket fuel. Beryllium oxide serves as a high-temperature insulator. Electrodynamic elements and filters are used in acoustics. In Minecraft from Beryl containing materials it is possible to make armor unique in price and properties, as well as tools for mining. On daylight – green-blue, at midnight – reddish color. Now you can select and order our cources!